What's the one ARC you'd love to get your hands on right now? 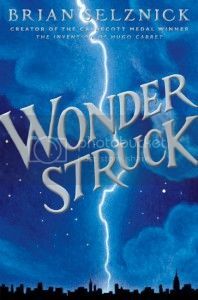 I was hoping to snag a copy of Wonderstruck by Brian Selznick at the American Library Association Annual meeting... but by the time I heard where they were, they were gone! I did another post recently about books that I was intrigued by, but didn't get ARCs for... not that I'm lacking for books to read! My To Be Read list is ridiculously long, and I've already got a healthy stack of ARCs by my nightstand. Excellent choice! :D I actually just checked out The Invention of Hugo Cabret from my library, and I can't wait under Wonderstruck comes out, too. Thank you for sharing and visiting. Happy reading this weekend! New follower- this book looks cool! i just added it to my TBR. I haven't heard of this book before! It looks sounds interesting though! Feel free to check out my BBH here. New follower! ME TOO my TBR pile and list is a mile long! I have to admit, I was very skeptical about the two storylines 50 years apart, but The Invention of Hugo Cabret was so good, I'm willing to trust Selznick on this one.